Win a copy of COMPOUND FRACTURE from Dread Central! 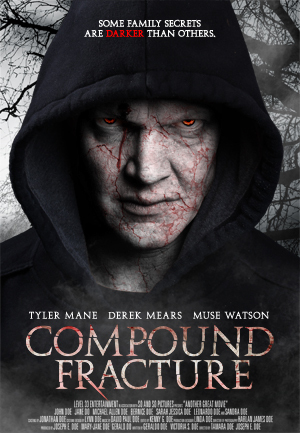 May 13th, Compound Fracture is released on DVD and VOD! COMPOUND FRACTURE wins Best of Festival Award in Hot Springs Horror Film Festival! TWO Chicago COMPOUND FRACTURE Screenings Added!!! Double Features with HALLOWEEN on Oct 30 and 31st!! 9/13 – Omaha, NE COMPOUND FRACTURE joins Creature Feature Live! Compound Fracture comes to Grand Rapids! Copyright © 2014 Mane Entertainment / Compound Fracture the Movie - All Rights Reserved.